Propane fire pits cool down quickly, which eliminates the risk of burning after the fire has been extinguished. When it comes to getting some kind of heating system in the outdoor area, the outdoor propane fire pit is the best option. The reason is that propane gas is the more efficient form of fuel and it is very safe because there is no smoke or ash to worry about. Propane is a reliable clean burning fuel and can be used around people and pets without any problems. Propane fire pits are also a lot more safer than any other type of fire pit because of numerous reasons. For one reason, propane fire pits cool down quickly, which eliminates the risk of burning after the fire has been extinguished. Even if the propane fire pit has been working for hours, it will cool down rapidly. In other fire pits, they do not cool down so quick so there is always a risk of burning even when the fire has been extinguished for hours. This is why you will need additional protection and increased vigilance for a regular fire pit even when the fire has been turned off. With the propane fire pit there is no such problem to consider. Another thing that makes the propane fire pit so safe is that there is no use of matches or lighter fluid. Both matches and lighter fluids are serious fire hazards and should be used with caution. They can be even more dangerous around curious children and you will need added vigilance for that. But with a propane fire pit there is no such problem to consider and you can simply turn on the knob of the fire pit to light the fire. No hassle of matches or any lighter fluids is required. 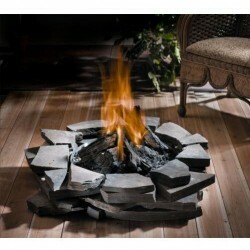 Propane fire pit should be used along with the propane fire pit table so that it becomes even more safe. The table provides a kind of cover for the pit to regulate and optimize the heat and also to make the pit a little safer. This is something that can be used in all kinds of outdoor spaces that you can think of. But it is generally better to use the outdoor propane fire pit on concrete rather than a surface of twigs and flammable materials like leaves and foliage. This will make the pit safer to use for all kinds of outdoor events and activities. One more method to make the outdoor propane fire pit safer is to install the right kind of outdoor lights. The lights should be especially installed in areas where the pit is located so it is nicely visible. You can find a lot of outdoor light options online like patio umbrella lights and solar driveway lights.